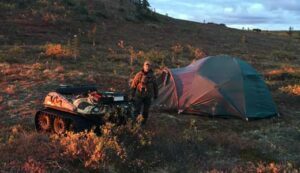 AlaskaChallenge Guide Service offers a few modes of transportation depending on the hunt and time of year. In the spring we will use snowmobiles to reach our destinations. In the summer and fall we use Argos on land, and jet boats over water. The jet boats are our primary source of transportation. As far as our camps go we have a permanent camp we will usually start out at and then, depending on the hunt, we will set up temporary camps. Regardless of the type of camp you will always have good accommodations which include; walled tents or cabins, heated interiors, cots for sleeping, plus satellite phones and other necessary gear depending on the climate.